The Noodle-Armed Review is intended for those players, like myself, who aren’t power arms and don’t quite hit 300 feet. Sure, it would be nice if you could throw longer, but let’s just hope you have a solid mid-range game to make up for it. Disclaimer: If you throw more than 300 feet, please disregard the following review and assume that the disc in question flies like a mighty Pegasus on wings made of platinum and pixie dust. Or, keep reading and give it a shot for yourself. In short, this one’s for the little guys. Summary: Just your average player who is happy to get a few rounds of disc golf in a week, but can’t seem to build up a cannon arm yet. 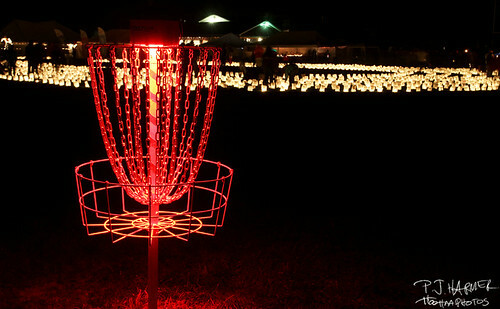 Darren Dolezel's lit-up basket at the local Relay For Life event in 2011. I recently came to the conclusion that I have an addictive personality. When I get involved in something I like and enjoy, I usually jump in full force and take it to another level. When I first got into disc golf, the first thing I purchased, besides many discs, was an Innova SkillShot portable basket. It was a good starter basket, but I didn’t think it caught discs as well as a real basket. Next came an Innova DISCatcher Sport, which turned out to be great. However, even though it was great, I couldn’t leave well enough alone. I wanted to find a way to modify the basket to make it better. Cue the music and let’s hit the garage! The first thing I did was get rid of the chains that came with the basket and replaced them with stainless steel chains. It’s not a cheap investment, but when you are blinded by the possibilities of what can be done, I tend to forget how much things cost. Not only did I replace the outer chains, but I also added inner chains. Like most disc golf courses, the one Trent Solomon designed and installed evolved from an idea into an arduous task. Filled with setbacks, delays, and even injury, Solomon’s course finally came to fruition in March, joining the numerous other disc golf courses being installed each year. There is, however, one exception that makes this project stand out from the rest — Solomon’s course is located in Haiti. 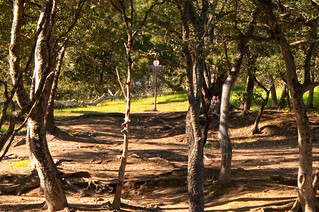 Open Door Haiti Disc Golf Course is the first of its kind in the Caribbean island nation. Comprised of four portable baskets, it sits on land that also hosts a church, a mission house, and a medical clinic in the city of Bois de Lance, about a half hour outside Cap Haitien. Solomon, 24, built the course while on a mission trip to work at an orphanage in Haiti. The orphanage houses children who were displaced by the magnitude 7.0 earthquake, which devastated the country in January 2010. The mission trip was facilitated by Open Door Haiti. Originally, the plan was for Solomon and his father to do electrical work for the facility, but it became much more. “The thing that really got me was the orphanage was actually built specifically for orphans from the earthquake,” he said. 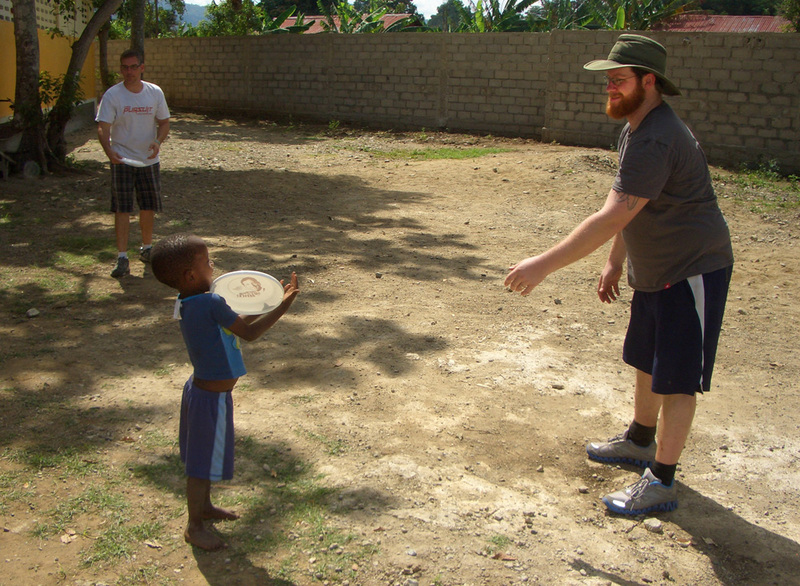 Being an avid disc golfer for nearly four years, as well as an assistant manager at retailer Marshall Street Disc Golf, exporting the sport to Haiti came naturally to the Winchendon, Massachusetts native. Solomon planned to gather discs from whomever would donate them, reaching out to fellow players, disc retailers, and even some of the top manufacturers in the sport. Despite striking out with most of them, he found success with Vibram, who donated five discs; Marshall Street, who donated a box of 30 lost and found discs; and Maple Hill Disc Golf Course, who also donated lost and found items. It started with a card. After my first round or two of disc golf, I wasn’t fully hooked. (Can you imagine that?) It was interesting, to be sure. But it’s not something I thought I would catch on as a personal sport or hobby. I couldn’t see it on TV. The closest course was a little more than an hour away. And, truthfully, it was frustrating to throw a disc, watch it sail 20 feet up in the air and then drop a mere 75 feet away. A few months after my initial exposure to the sport, I was at a baseball card show with a friend. I’ve long been a collector of baseball cards, so I’m always interested in opening new items. During this trip, two of us decided to split a hobby box of 2010 Allen and Ginter cards, a Topps product. Midway through the box, I cracked a pack and sifted through the cards. I abruptly stopped as I came across an interesting one. Though Allen and Ginter cards are mainly baseball, the set also features some interesting people — such as athletes from other sports, pop culture items and even odd things from many years ago (such as having a strand of hair from George Washington). The card I pulled out of an Allen & Ginter pack. And there, staring back at me, was Avery Jenkins putting. A disc golfer and somebody I had never heard of. That made me wonder why in the world he was on a card. Turns out he’s one of the best in the world. At disc golf. When I started playing, I realized there was some sort of a national tour. I understood there were some major tournaments. And heck, I realized people made some coin playing disc golf. But was this game big enough that Topps would find a disc golfer to put on a card? 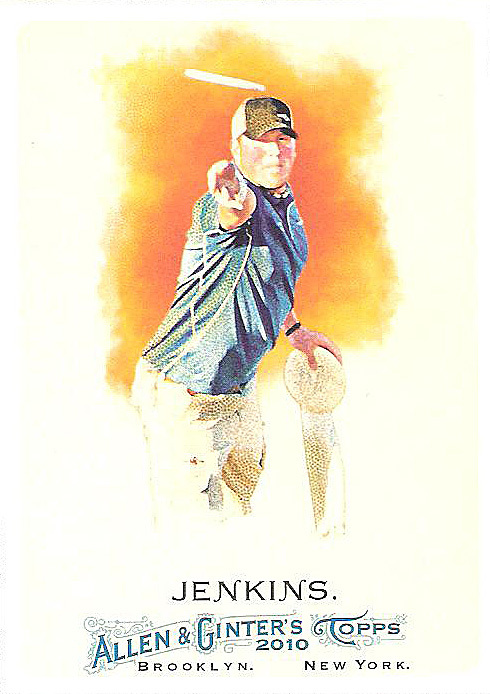 And with further research, I found out there were certified autographs and game-used cards for Jenkins. Poll 7: Tournament count this year? Before we get to this week’s poll, let’s take a peek back at last week’s answers and responses. 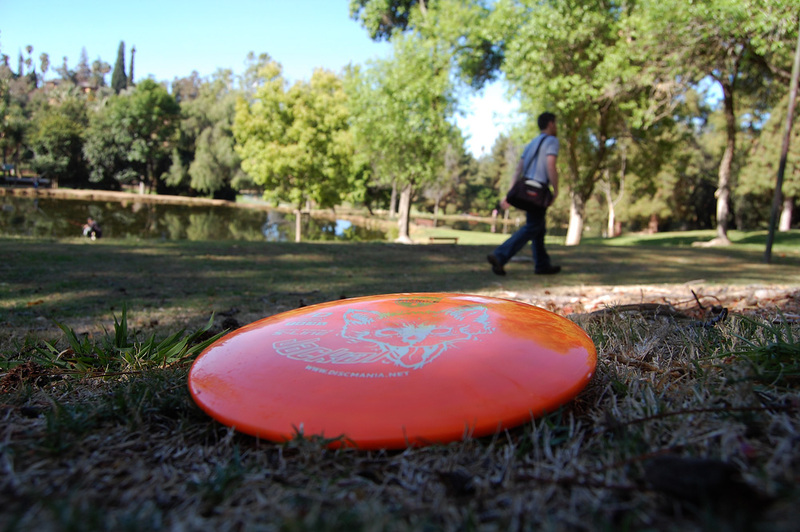 We asked our readers why they played disc golf. And, I have to be honest, I did not expect the winning vote — exercise. A total of 94 people cast votes for this poll (voters were able to choose up to two answers). Exercise garnered 34 percent (32 votes) of the poll. Being out in nature followed in second with 27 percent of the vote (25 votes). Hanging out with friends placed third (23 percent/22 votes), and competition (22 percent/21 votes) placed fourth. Relaxing and watching the disc fly tied for fifth (21 percent/20 votes). It’s funny, because I’ve heard so many people say disc golf isn’t exercise. I’ve even heard disc golfers say that. And it makes me scratch my head. I always thought getting out, being active, walking a couple of miles and working different parts of your body would be exercise, no? It’s not running a marathon, but it’s exercise. I’ve left many tournaments knowing the next day I was going to feel it. So, it makes me smile knowing exercise was the top vote getter (it was one of the ones I personally voted for, along with hanging out with friends). With the National Disc Golf Championships for college and the Glass Blown Open A-Tier events going on this weekend, it was a good week for news in the mainstream media. From television to print media, disc golf was in the news — and that’s a good thing! 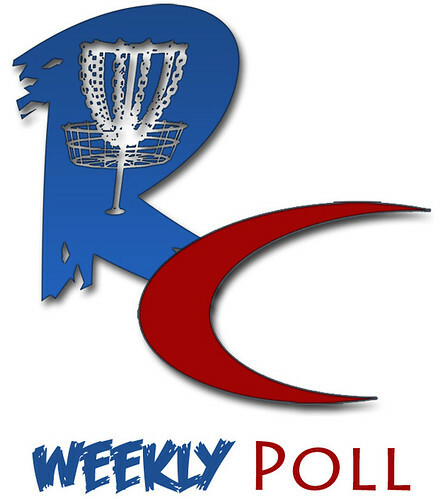 There were some overall good reads this week, so check out the weekly wrap below and get your fill of disc golf stories and news! 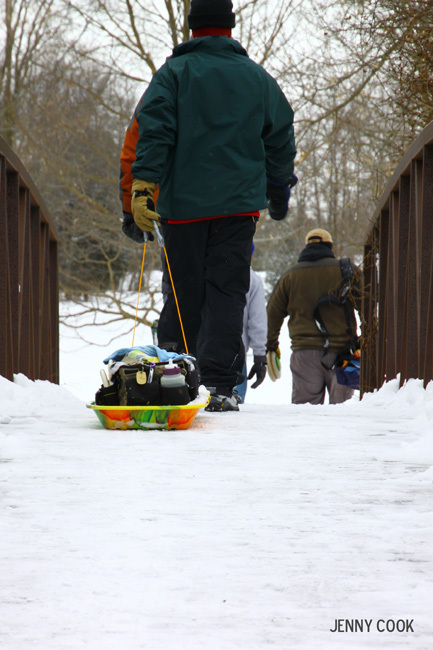 Winter version of a pull cart – I call this: Brilliant! We are the pioneers of disc golf and with that comes something new to be seen at almost every tournament I attend. Jericho Lake in Aurora, Il. This is the way to play disc golf in the winter! Personally, I don’t dig flinging plastic when there’s snow on the ground. But when you decide to do so, why not do it in a way like this? Kudos to the person pulling the sled. Keep the bag as dry as possible and go do your thing. NOTE: We’ve received some photos for the photo of the week contest, but there’s no information attached. We need info about the image to the best of your ability. Also, if you have a good shot — please send it in! We can’t continue these features without the help of disc golfers! Have some great images you want to share with the Rattling Chains readers? Please e-mail pj [at] rattlingchains.com with the subject “Photo of the Week.” Please note that we can’t guarantee all images will be used. Send as many as you would like as if the photos are top notch, we’ll use more than one from you! When sending in images, please remember to send the story about the photo, the location and any technical information possible! The story can be as long or as short as you like, but please make sure you give some details! Discmania is hoping that disc golfers everywhere are ready to go Deep in the Game. All episodes will be free. Deep in the Game will air for five episodes and will cover the topics of putting, backhand, sidearm, mental game and monster distance. Putting is on the schedule for Monday and the remaining episodes will be released every second Monday. Today’s hopefully useful game improvement post touches on a way you can improve scores on the course by recording and mining the data of past rounds while off the course. However, talking about crunching numbers tends to get dry in a hurry — especially if you’re reading this in a disc golf frame of mind. So we’ll ease into the meat of this lesson by way of an illustration. The guinea pig in this case is yours truly. I shot an even-par 84 (28 holes) morning round at DeLaveaga last weekend, and earned satisfaction on two different counts. First, with the exception of only a few holes, the course is set up in its toughest configuration in preparation of the fast-approaching Masters Cup — an annual stop on the PDGA National Tour. Par in that layout is good for a plus-1000 rated round, and right now, I’ll take that any day of the week and twice on tournament weekends. The other reason why I was able to bask in my own pysche a little after my round today — and the main subject of this post — is that I had a game plan and executed it quite well. My strategy at DeLa, when the course is long, is to think par at nearly every hole, even off the tee, and even though I can birdie most of the holes with a perfect tee shot and good putt. The result in this case was 24 pars, two birdies, and two bogeys — one of which was on Hole 13, which plays more like a par 4. So why play for par on a hole when I know I’m capable of doing better? Because being capable of a executing a shot once and being capable of executing it consistently are two very different things. Understanding that basic fact is the first step in properly assessing the risk/reward quotient of every shot in golf — disc or otherwise. The stories were great — now let’s give away the plastic! Oh how sweet it is to win a shiny new disc, eh? 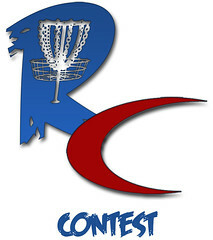 For the past two weeks, we’ve run a contest where disc golfers could share their favorite stories and have a chance to win a new disc. I thought we’d gather more entries than we did. After all, free plastic is free plastic, eh? Instead, we only received 16 entries, which is slightly disappointing. Especially when free plastic is involved. Still, we received some good stories. And for the 16 who entered, it’s much easier to have a chance to win via the Random.org randomizer! All of the stories were quite fun to read. They differed in tone and substance, which really shows the versatility of the game and how different things can happen. How about Kevin, who suffered a broken ankle and when he was on the mend, he went out for a round with some friends and his brother. He then decided — on a hole not known for aces — to call a skip ace.